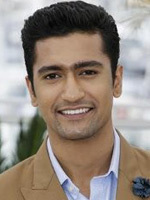 Vicky Kaushal is born on 16th May 1988. His father, Shyam Kaushal, is a Bollywood action director and stunt coordinator. His brother Sunny Kaushal, is also associated with the Film Industry. He graduated as an electronics and telecommunications engineer in 2009 from Rajiv Gandhi Institute of Technology, Mumbai. He had job offers but, he got involved with theatre. He joined an acting workshop under Kishore Namit Kapoor. He debuted with like Luv Shuv Tey Chicken Khurana in a minor role which continued to Bombay Velvet. In 2010, he assisted Anurag Kashyap on the two-part film Gangs of Wasseypur. His official major breakthroughs were Neeraj Ghaywan directorial Masaan and Anurag Kashyap's psychological thriller Raman Raghav 2.0. He had also done a youtube video with famous YouTubers AIB which was a parody of songs, Harassment Through The Ages. He did a short movie Geek Out in his early days of career.